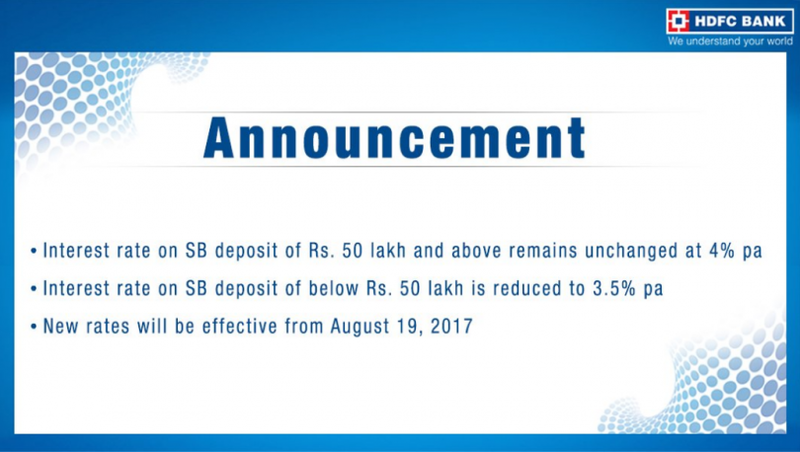 The major banks HDFC and PBB decrease their interest rates by 0.5% on saving accounts which have deposits less than 50 lakhs i.e 3.5% per annum which will come in effect from Saturday. HDFC Bank said that customers who will maintaining savings bank account balance of Rs 50 lakh and above will continue to earn interest at 4 per cent per annum. These revised rates will be applicable for both resident and non-resident customers, HDFC Bank said. Similarly, PNB said that they decreased the interest rate on saving account deposits up to Rs 50 lakh by 0.5 per cent i.e 3.5 per cent, whereas savings fund account balance of above Rs 50 lakh will garner interest at the rate of 4 per cent per annum. In recent days, many private and public lenders including the State Bank of India have slashed their saving account deposit rates.